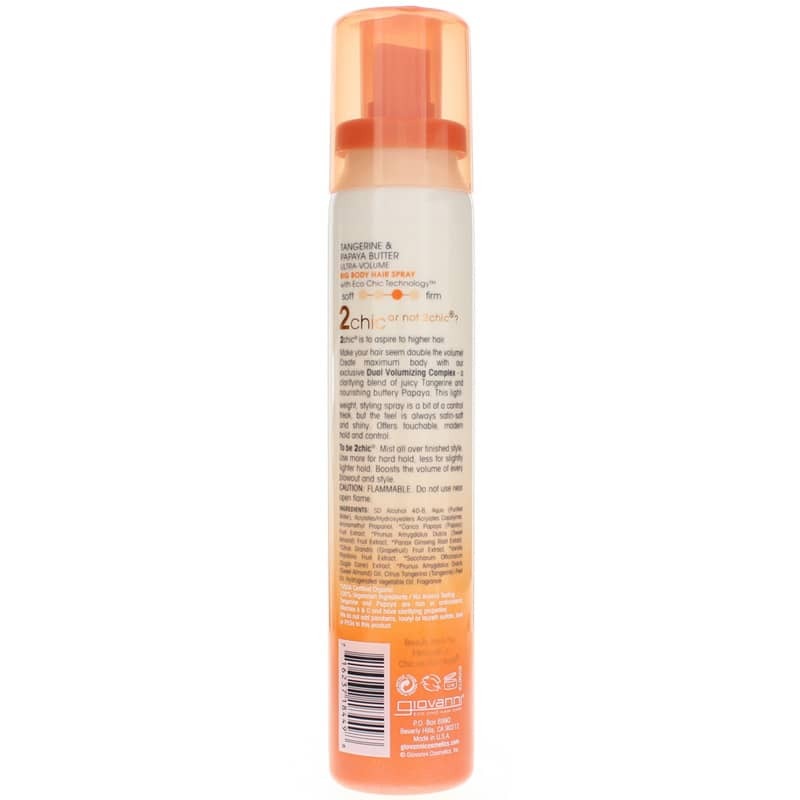 2 Chic Ultra-Volume Big Body Hair Spray from Giovanni is a lightweight way to hold hair in place while providing volume with tangerine and papaya butter. Ships today if you order in the next 9 hours 25 minutes. Try 2 Chic Ultra-Volume Big Body Hair Spray - because bigger is better. Featuring Giovanni's Eco Chic Technology, 2 Chic Ultra-Volume Big Body Hair Spray has a dual volumizing complex of tangerine and papaya butter. This formula helps build volume without adding weight or greasiness, so you get the hold you need without sacrificing body! You'll love how this hairspray takes your style to new heights. <>Full body while holding hair in place. Order 2 Chic Ultra-Volume Big Body Hair Spray today! SD Alcohol 40-B, Aqua (Purified Water), Acrylates/Hydroxyesters Acrylates Copolymer, Aminomethyl Propanol, *Carica Papaya (Papaya) Fruit Extract, *Prunus Amygdalus Dulcis (Sweet Almond) Fruit Extract, *Panax Ginseng Root Extract, *Citrus Grandis (Grapefruit) Fruit Extract, *Vanilla Plantifolia Fruit Extract, *Saccharum Officinarum (Sugar Cane) Extract, *Prunus Amygdalus Dulcis (Sweet Almond) Oil, Citrus Tangerine (Tangerine) Peel Oil, Hydrogenated Vegetable Oil, Fragrance. Mist all over finished style. Use more for hard hold, less for slightly lighter hold. Boosts the volume of every blowout and style. Flammable. Do not use near open flame. This is a great hairspray, it has a firm hold without being too stiff, and it's healthier than a lot of other sprays. Oh, it smells goof too! My hair is straight and baby fine. This hairspray holds great and smells good too without all the harmful chemicals.